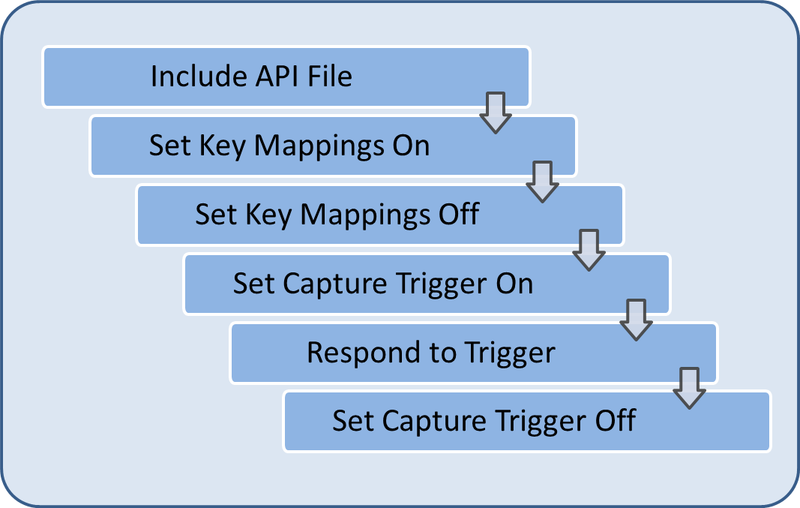 This tutorial covers the use of the Enterprise Browser KeyCapture API to remap hardware keys and assign actions to the device hardware trigger. 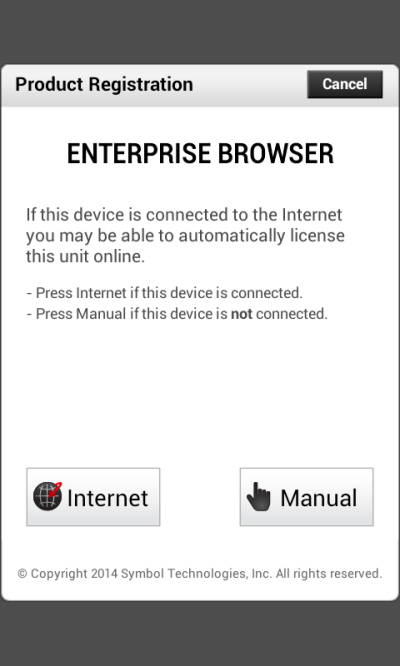 Enterprise Browser includes an API for remapping key codes and assigning functions to hardware keys. The steps shown below are typical for code that uses this API. The following tutorial will walk through creating a working example application using these steps. Buttons to turn trigger and key capture on and off. Create a file named keycap.html in your application directory and open it in a text editor. To verify that key mappings are functioning properly, we need a way to identify key codes of keys that are being pressed. To do this, we will run the following code on startup to capture the keys and send their value to an element for display. In the first three lines of code above, three keys are remapped: the volume-up and volume-down keys and the menu softkey on a TC55. After that we set a text indicator letting the user know that key mapping has been turned on. If you're working with a device other than the TC55, you'll be able to adjust which keys are mapped in a later step. The next function provides a way to remap and reset the keys. In this method, we reset the key mappings by calling the same remapKey() method and setting the second parameter to an empty string. After resetting the keys, the method modifies the text indicator to show the user that key mapping has been turned off. The KeyCapture API also lets us map a custom function onto the device's trigger key. This method calls the captureTrigger() method and passes a function that will then be called whenever the hardware trigger key is pressed. A text indicator is set so that the user knows that the trigger capture is in effect. The callback simply echoes the callback parameters to a display area on the screen. In a real application, you might use this callback function to open a screen or begin a process. This method resets the capture trigger by removing the callback function from the trigger key and calling the same captureTrigger() method without a callback function. Create a directory on your device for the KeyCapture application. Make sure the directory is in an unrestricted location to avoid any permissions issues when Enterprise Browser tries to open the files. We'll place our sample app's files in the device's root directory and show you how to modify the config.xml file accordingly. Update the StartPage setting in config.xml to point to the location on the device where you placed keycap.html and save the changes. Click the trigger button on the device to test the trigger function. Nothing should happen. If something happens at this point there may be something attached to the trigger via DataWedge. Find the DataWedge application, make sure that any profiles have been deactivated then return to the key capture app. Click on the TrigCap On button. 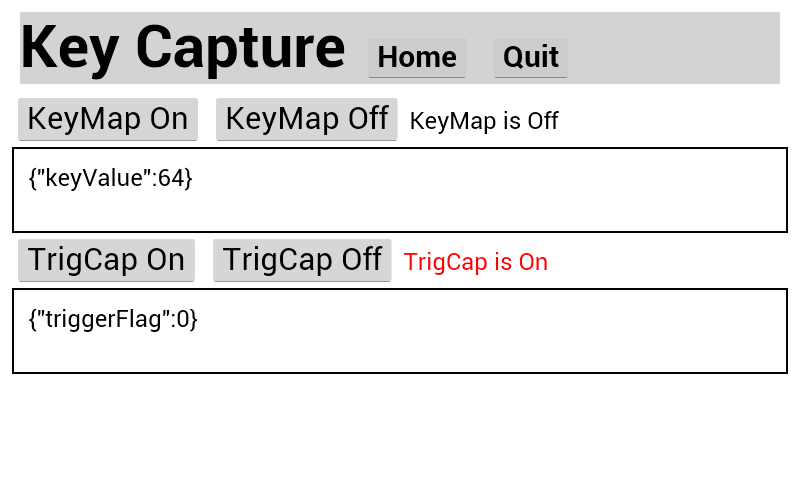 The text indicator "TrigCap is on" will be displayed in red. 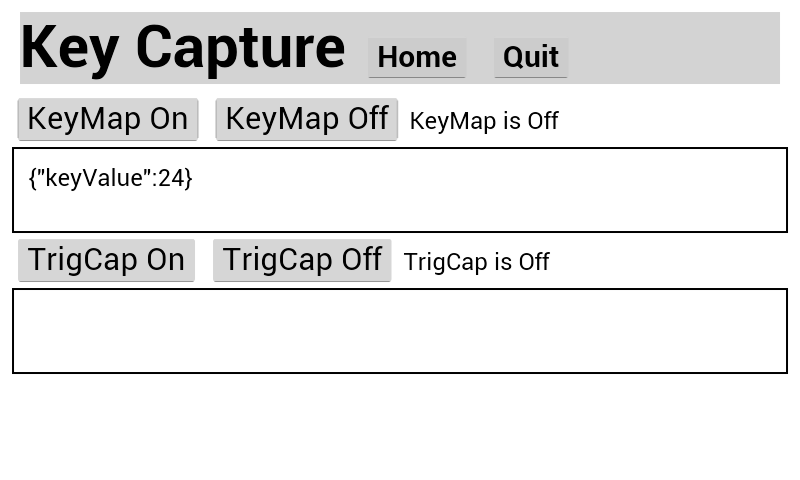 Click the TrigCap Off button. 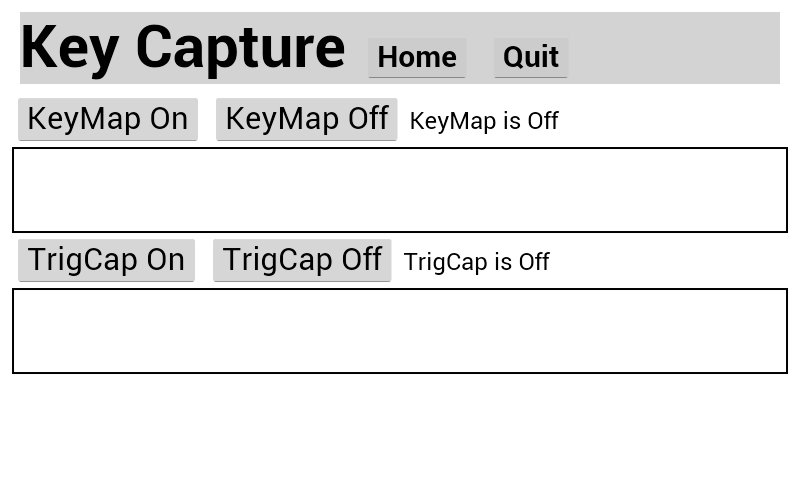 The text indicator "TrigCap is off" should appear in black. Pressing the device's hardware trigger will no longer activate the callback function. To test the key mapping functions, click on a few of the device's hardware buttons or a soft button like the Menu button (soft key) on the TC55. You should see the key value appear in the key mapping display area. Since we have not yet turned on the mapping what you see here will be the true unmapped value of the key. In the case shown below, we've clicked on the volume-up key, which has an unmapped value of 24 on the TC55 device. The value on your device may be different. Now click the KeyMap On button. The text indicator "KeyMap is on" should appear in red. Try pressing the up volume key again. If the up volume value before was 24 it should now show as the remapped value of 64. If the key values on your device differ, you will need to go back to the fnKeyMapOn() and modify the mappings. For each of the remapKey() methods, set the first parameter to match the actual unmapped value of one of the hardware keys on your device. Set the second parameter to be the value you want to map it to. Any changes to the key mapping method also should be applied to the fnKeyMapOff() method, except that the second parameter should always be an empty string. After making the changes, copy the app files over to the device and open the application. Try pressing the mapped hardware keys to show their unmapped values. Then press the KeyMap On button and try the hardware keys again. You should now see the mapped value. This completes the Enterprise Browser KeyCapture API tutorial. For more information on the KeyCapture API, please refer to the Enterprise Browser API documentation.